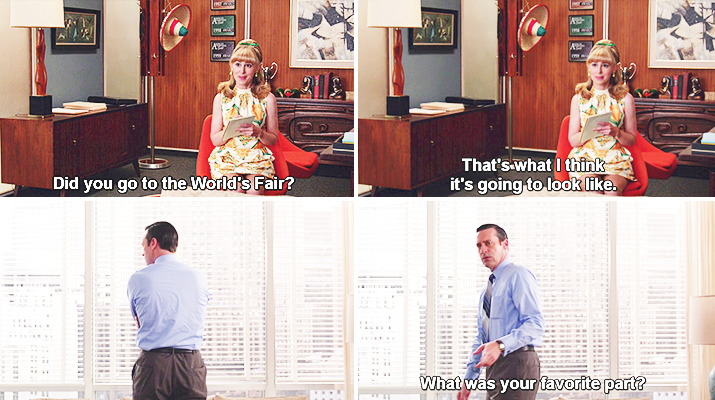 Seeing Don say the future is supposed to be better is just about the saddest thing that ever came out of his mouth. But what would be better? Still echoing the lament of Is That All There Is?, The Forecast has Don working on a statement for the future of the agency, only to realize he’s become a man with no dreams. It’s interesting to note the different ways in which he treats Ted and Peggy when asking what they envision for the future. With Ted’s dreams, Don is dismissive and unimpressed, but when it comes to Peggy’s he pushes harder, further and further into the future until she’s in his shoes – perhaps because he sees a part of himself in her. 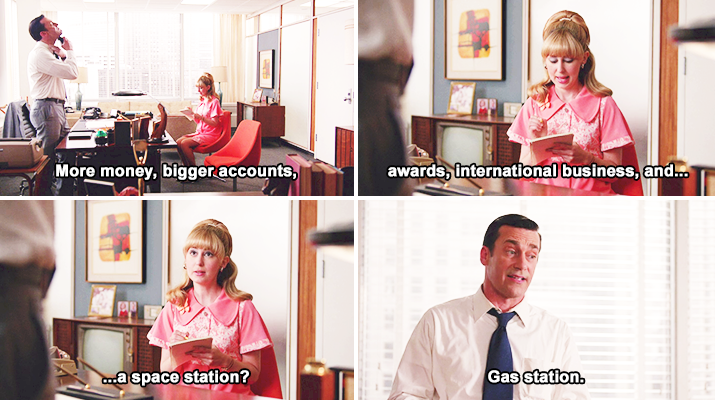 In fact, while Peggy confesses her desire to become the agency’s first female creative director (he actually smiles at this one, it’s sweet), land a big account, and create a good catchphrase, Don’s mind seems to be going Been there, done that. What comes next? Indeed he’s done it all, and yet happiness did not follow. 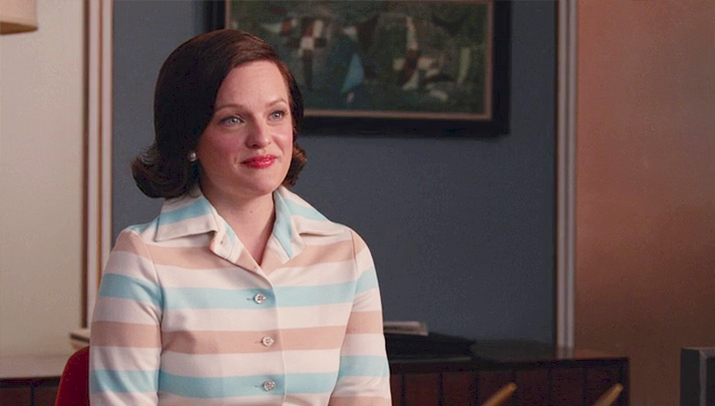 But like Peggy said, life’s meaning doesn’t come from your job. It’s a part of it, but that’s not all there is. Jesus, love again? Yes, love for your family, friends, significant others, but first of all, for yourself. And as Don is repeatedly told he’s a failure, a sad person with no character, and an attention-grabbing manwhore, he looks at his life and the man he’s become and he doesn’t like what he sees. Worse than that, he can’t believe the future gets better. » You’re a very beautiful girl. It’s up to you to be more than that. It was a tough episode for Sally. First she was forced to sit through the unbearable and cringe-worthy sexual tension between Glen and Betty – and she doesn’t know the half of it. Then she learned that Glen is shipping to war, and didn’t get to say a proper goodbye. And to top it off, Don takes Sally and her friends to eat chinese, and she has to watch yet another friend flirt with one of her parents. 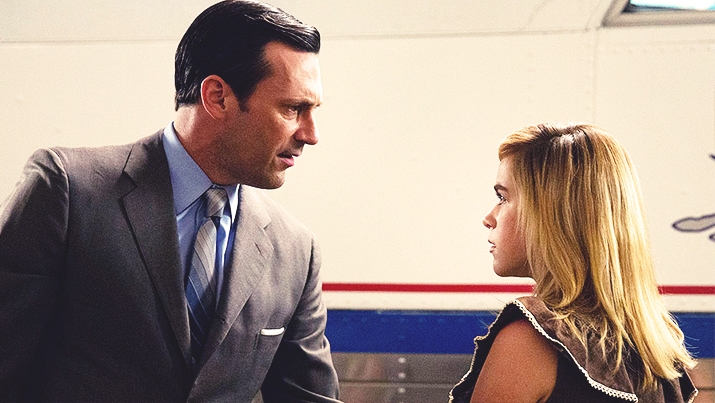 I don’t believe Don was flirting back but, arguably, oozing is his natural state – he can’t help being rich and handsome. He can, however, try and be more than that, which is what he tells Sally when she cruelly says her dream is to become a different person than Don and Betty. “You might not want to listen to this, but you are like your mother and me. I really loved this moment between them, they’ve always been one of the most interesting duos on the show. Especially when Don grabs her and says I’m your father – finally, now act like it! I honestly hope this isn’t the last time we see Sally. In one of the office scenes, Don walks into Ted’s, sits down and asks, You ever feel like there’s less to actually do, but more to think about? It’s the predicament of anyone who’s ever found themselves with too much time on their hands. 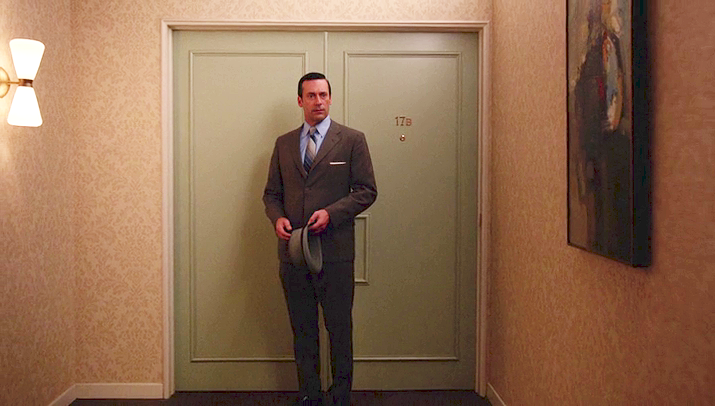 In Don’s case, coming home to an empty and silent apartment (excuse me, penthouse) gives him too much room to think. Even if he wasn’t trying to (didn’t really clean the carpet, didn’t even bother checking when prospectors would come in), he now quite literally needs to find a place, forced to move out, move on. » There was a lot of talk about failure in this episode (This place reeks of failure / Take responsibility for your failure / Don’t blame your failure on me), and all of it directed at Don. But the most interesting thing is that to blame him is – for once! – unjust. The real estate lady can’t sell a penthouse on the upper east side because it has no furniture? And Mathis got what he deserved, that guy is a joke. » We see Joan happy with her professional situation, but struggling with being a single working mom who still wants to date (e.g. You’re ruining my life!, directed at the baby). I’m happy for her with the Richard thing and all, but my Joan/Roger ship is sinking way too fast.